Hair: Blond, curly and hanging to just below the shoulders. Although a Wolfrider of over 500 years, he has decided to inhibit the growth of face-fur. 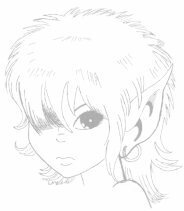 Life history: Mender is the youngest child of Woodlock and Rainsong, a healer and the only full-blooded Wolfrider who was conceived, born and raised to adulthood in Sorrow's End. In spite of this he is fully a Wolfrider, both in the physical and mental sense. Although never unhappy in the Sun Village, Mender has always aspired to the true Wolfrider life, trying to find a balance between his gentle healing side and his fierce wolf side, his great idols being Leetah and Cutter. This duality in his nature was very well demonstrated at the Go-Back attack: Mender ended up healing everyone as best as he could, though many of the wounds had been inflicted by himself during the fight. Mender joined the Wolfriders across the Vastdeep Water in suspended animation, together with (amongst others) Dart and his sister Newstar. He joined them in order to be able to meet both his heroes and learn from them. This wish was fulfilled when Leetah came to the Sun Village to heal all the elves whose wounds had proven too much for Mender's ability. With her also came Ember, whose appeal was immediate to Mender, who saw in her the same duality that he was struggling with himself, though he may also have admired her for the fact that she was the daughter of his two rolemodels. Still, they lovemated quickly and Mender came back with them to Thorny Mountain Holt. When the war for the Palace Shards was about to begin and Cutter split his tribe, Ember shocked Mender by choosing her mother Leetah rather than him as her healer, claiming that she needed to be taught softness rather than hardness. This way she did give him the chance to fulfill his dream though: going on a quest under the leadership of Cutter. He proved very useful, like a healer almost always is, healing many, though he was unable to save Skot and Zhantee. After the war he went with Ember to Howling Rock Holt to help her clear the area of Winnowill's shapechanged creatures. Although he was initially competing with Teir for Ember's affections, he was highly unwilling to be 'a golden-haired Rayek to his Cutter', and he now seems happy in a lovemating with Yun.